We continue to innovate in the field of the pulleys and the introduced range of the self cooling pulley in India, is the best paradigm of thereof, which is developed to reduce energy consumption and bring in the self cooling aspect. 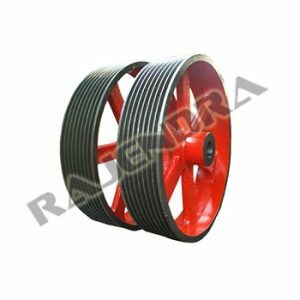 The use of the SG iron material in the construction helps the proffers the four time better strength than that of the cast iron, in short, this self cooling pulley promises for the durability and long life span, is what customers seek for while selecting a pulley. We have an extensive collection of this self cooling pulley in India that one can avail at the best prices in the industry.